A small back yard does not have to be just a patch of grass devoid of landscaping elements. There are many things that can be done to help it look nice and at the same time make it a useable outdoor space. The key is to choose plants and designs to fit well within that available area. You won't be able to have a large pond or tennis court, but careful planning will make it possible to have a beautiful back yard to enjoy and relax in. If you have a fence, hide it by planting tall growing shrubs against it, with lower growing plants in groups in the foreground. Between these groups, you can plant small clumps of perennials or colorful annuals that will look cheerful against the green backdrop of the hedge plants. Select 2 or 3 small shade trees or dwarf fruit trees as focal points. 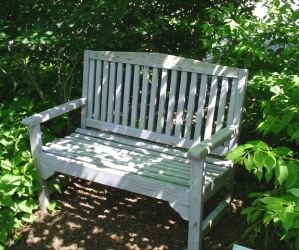 Maybe one of these can go near the corner in your fence along with a comfortable outdoor bench. To make the most of your trees, don't just let them stand there by themselves. Surround them with a deep layer of mulch contained by a generous free-form stone or wood edging. The same edging material can be placed to border your fenceline plantings. You can plant shade-tolerant flowers such as impatients, hoyas, ferns and others including groundcovers like ivy, periwinkle or mondograss. And yes, you can have a boulder or two in there as well, but small ones. Remember to keep things in perspective. If you have a patio, you may also think about using containers for specimen plants such as roses or geraniums. Another thing you can do that will take very little space it to add a raised bed against the building wall. This can be inexpensively constructed from materials such as treated fenceposts or railroad ties. Or, if you have a little budget, you can build more permanent beds using brick or stone. The planters should be no more than 30 inches deep so that you can easily reach to the back. Select cool blues, white or pastel colored flowers that don't overwhelm the eye. Another nice touch could be a small water feature such as a plastic pond with perhaps a waterlily or two. This can be set off very effectively with ferns or bamboo along one or two sides. Even a small birdbath can add a feeling of elegance to your small back yard. So with a little planning, even if your back yard is small and you are on a tight budget, it is possible to design a landscape that utilizes the space in an attractive manner. By carefully considering your design, using small features and cool colors, you can have a very nicely landscaped and cozy back yard that will take the minimum of time and effort to maintain and will surely be a wonderful place to relax as well as an asset to your property.